Imperial have been extremely supportive of our project and helped us several times when we encountered difficulties due to the limited equipment available to us. Obtaining the culture of Synechocystis PCC6803 - when discussing the initial idea for this project they mentioned that one of their labs holds a stock of Synechocystis PCC6803 that they would be happy to share with us. They put it in the post for us and we had it within a few days. Providing us with our dual host vector - as parts for cyanobacteria are rather limited in the registry we turned to one of the Imperial labs for help with the vector for this transformation. We were pointed in the direction of Pauli Kallio from the University of Turku, Finland (their collaborator), who gave us permission to use their vector. The Imperial team then promptly provided us with it. 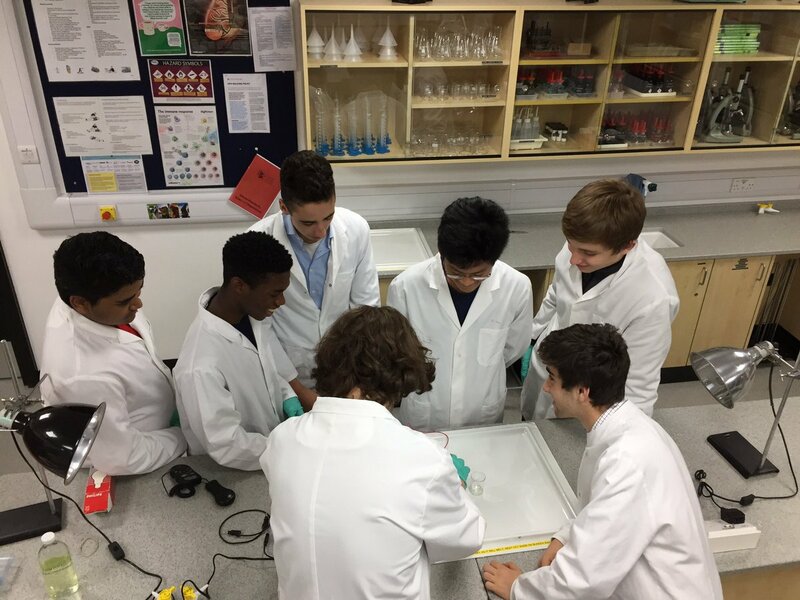 Blue box for gel examination - given our struggles with our own electrophoresis kit(our dye was not specific enough), the Imperial team lent us their spare BlueBox so that we could start using SybrSafe dye, producing far better results and allowing our project to move forwards. Competent cells - as a school we have no access to a freezer where we could keep chemically competent cells, but thankfully the Imperial team very kindly shared theirs as well as their facilities for us to perform transformations. They also taught us about safely transporting microbial plates across town. GoCulture Game - we have been testing Imperial team's computer game, both within our team and with younger pupils. We met up with them in order for them to see some students playing the game and for us to give them the feedback that they needed. Providing us with our dual host vector, as parts for cyanobacteria are rather limited in the registry. We were pointed in the direction of Pauli Kallio from the University of Turku, Finland (their collaborator), who gave us permission to use their vector. As we don't own a spectrophotometer, we couldn't use the optical density measurements to measure the growth of Synechocystis PCC6803. Instead, we opted for a colorimeter, but the UCL team offered to measure the OD for us, just so that we could calibrate and verify our method. As the only other UK team this year, we have discussed our approaches to Public Engagement with them and have spoken to them about the game we were developing for younger students.